I started using the HDX-250 about one month ago and have been thoroughly pleased with every aspect of this safe. The lock operation is smooth and fluid. 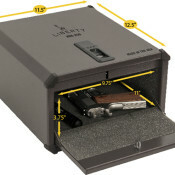 Safely secure your valuables or handgun in the new Home Defender (HD) Series by Liberty Safe. The HDX-250 Smart Vault allows for quick and secure access by using our 5th Generation BIOMETRIC finger swipe technology. This is the most reliable biometric entry system available, with supreme accuracy and the lowest fail-rate on the market. Speed counts! Entry using the Biometric swipe can be obtained in 1 SECOND when utilizing the AC adapter (included) and in under 2 seconds (1.63 to be exact) with the 9v battery (included). The Smart Vaults can accommodate 15 different fingerprints. The HDX-250 has an auto-opening door, just swipe your finger and the door opens. Mounting holes are located in the bottom of the box for direct mounting, an optional accessory mounting bracket is also available. The HDX-250 has been designed to safely store your firearms until the moment you need it. The Heavy Duty 14-gauge steel door has built-in anti-pry tabs and the reinforced latch system is specifically designed to resist pry attacks and other attempts to gain entry. Liberty engineers and tests everything that we build so that you can trust your vault to protect your firearms and your family. Speed and Security when you need it most. Don’t settle when protecting your family…trust the best, trust a Liberty! Made in the USA!